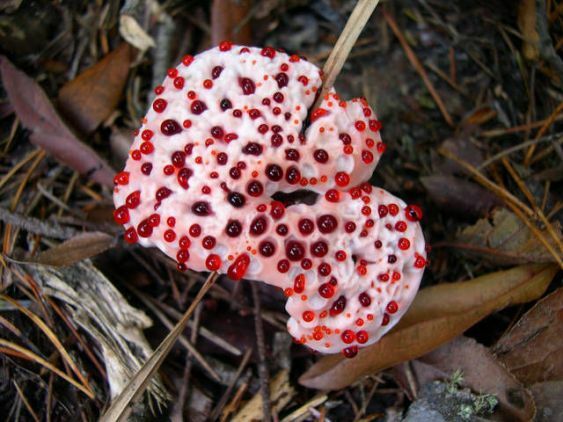 Greetings, I am glad that you have stumbled upon my webpage devoted to the fascinating fungus Hydnellum peckii (Banker,1913), commonly known as the bleeding tooth fungus, Devil's tooth, red juice tooth or strawberries and cream fungus. Chances are that your familiarity with H.peckii is scarce, perhaps limited to a few dazzling pictures with short captions. My purpose in creating this website (apart from it being a class project) is to change that. 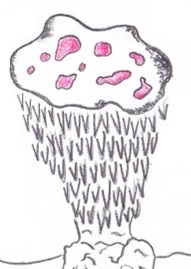 I would like to take you on a journey to delve beneath the admittedly picturesque pileus of young H.peckii and get to know the true organism inside with its many intriguing eccentricities. Furthermore, I am hopeful that as you scroll through my webpage, you will find at least one tidbit of information to take with you and perhaps share. Think of it as a morsel of candy for your brain. So if you are up for the journey, I challenge you do go forth, explore my page, and learn something. To begin your journey, go onward and learn about the classification of H.peckii.